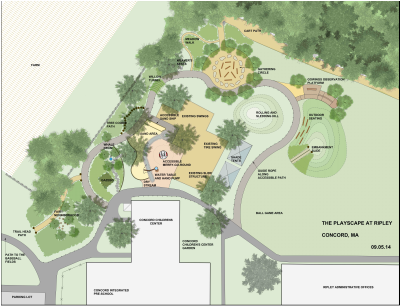 The long term vision for the Playscape at Ripley integrates the area currently used for the Concord Children's Center playground with the new, accessible, natural playscape features as well as trailhead access to the path around Gowing's Swamp. Costs for the entire Playscape total $340,000. Target completion date is 2016. Jennifer Brooke, founding co-principal of Lemon|Brooke landscape architects, is the Playscape’s lead architect. Jennifer’s more than 20 years’ experience as an architect of both buildings and landscapes, combined with her personal experience as a mother of both typical and special needs children, have resulted in her professional interest in the intersection of aesthetics, accessibility and tactility in landscape design. Lemon|Brooke actively collaborates with their clients and consultants to collectively establish project goals. These goals guide the creation of landscape spaces that are sensitive to the existing subtleties of site dynamics, elegantly respond to the functional needs of the client, consider historical context, and use appropriate materials and construction techniques.